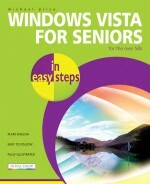 Windows Vista for Seniors in easy steps introduces the features of the latest Windows operating system, presented with the over-50's in mind. It uses larger type for easy reading, and discusses the topics in a clear and concise manner, avoiding esoteric computer terminology. It concentrates on the activities that you will want to carry out, whether you are completely new to computers, or you are upgrading from a previous version of Windows. Windows Vista for Seniors in easy steps starts with what you need to choose and set up the right edition of Windows Vista for your purposes. It helps you customize your system to suit your way of working, and looks at the various components such as the desktop, the sidebar and the hardware elements, to see how they should be configured. Windows Vista for Seniors in easy steps covers networking, electronic mail, the Internet, digital photography, music and video. It reviews applications and games that are supplied with the system, and identifies sources of help and support. The issues of security and the requirements for maintaining your system are also considered. Michael Price is an accomplished author, IT journalist and systems consultant with a wide experience of computing systems ranging from mainframes to personal computers. He's also a successful author with several best-selling In Easy Steps books to his credit.